I recently posted about the absurdity of the new ICD-10 coding system, which features various crucial codes, such as “bitten by orca” and “sucked into jet engine.” In my usual sarcastic manner, I pointed out how silly the level of detail of the coding system is. Well, I stand corrected after reading this article today. It appears that Harrison Ford was injured on the set of the new Star Wars film, when the hydraulic door of the Millennium Falcon starship fell on his ankle. Poor guy. He was airlifted to the hospital and is expected to do ok (and I must say that Harrison Ford is looking mighty good at 71). Wait! I’ve got it! V95.40XA (unspecified spacecraft accident injuring occupant, initial encounter)!!! Whew. That was close. 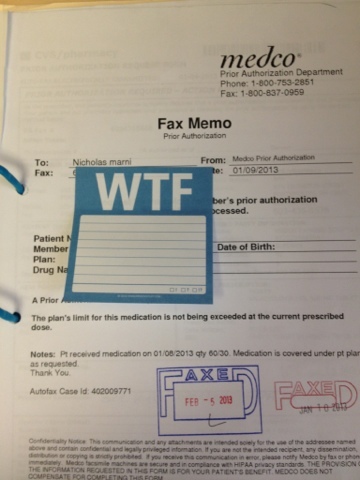 Thank heavens for ICD-10! His company “helpfully” suggested an alternative. Just to be clear- trazodone is in no way a similar drug to temazepam. They are not in the same class of medications, and have different efficacies and side effects. Now, I was surprised that temazepam, a drug that has been generic for quite a while, was so expensive. So I decided to find out what the retail cost was. Sure enough, you can get a month’s supply at Costco for $9.33. What could possibly be the excuse for this? I understand that a store like Costco might use cheap prescriptions as a loss leader for people to shop there (although anyone can use their pharmacy, you don’t need to be a member). However, I would like to point out that UnitedHealthcare Insurance Company had a 2012 profit of $5.1 billion. That’s $5.1 billion. Just wanted to make sure you got that. Most of us have noticed that our insurance premiums have gone up quite a bit this year. That’s why this stings even more- it appears that some insurance companies are actually profiting off of our medication expenses. As for my patient, I kept him on his temazepam, and told him to fill the prescription at CostCo and to pay cash. Wow. Express Scripts/Medco must really HATE people who have herpes. This is the second post in a row about trying to get proper treatment for this condition. 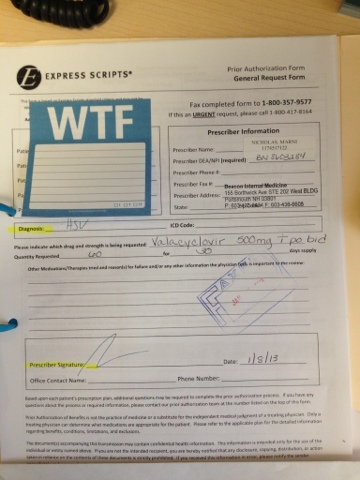 This time I wrote a prescription for acyclovir, a generic anti-viral. 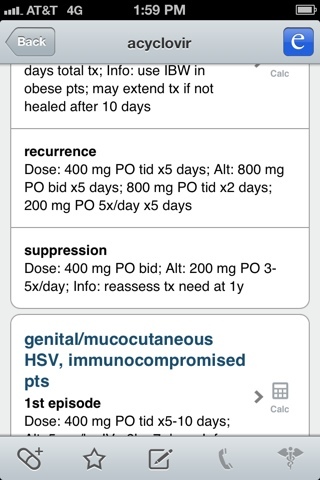 The correct dose for suppression of herpes is 400mg twice a day. That’s what I wrote for. Ok. First of all, who the HELL figures out dosages like this? 80,000 mg of acyclovir every three months? What???? So, I did a couple of quick calculations in my head. 400 mg x twice a day = 800 mg/day. 800 mg/day x 90 days = 72,000 mg. So, this is what I sent back to them. It’ll be interesting to see what they say. 80,000 mg per 90 days = 888 mg/day. Acyclovir comes in 200, 400 and 800 mg tablets. How do they expect anyone to take 888 mg/day? As you may or may not know, Express Scripts and Medco merged last year. What are Express Scripts and Medco? They are what’s known as Pharmacy Benefits Management companies (PBMs). Basically, they are a third party that processes prescription claims. They are the ones who create the charming prior approval forms that I’m always complaining about. Anyway, two of the largest companies, Express Scripts and Medco, merged. They made sure to reassure customers that they would continue to “receive the high-quality care you expect.” Well, my expectations were pretty damn low, and I’m happy to report that the newly merged company has more than met them. Oh, I hope you enjoy my new Post-It notes that I’ve used to block out identifying information. They eloquently express my feelings. 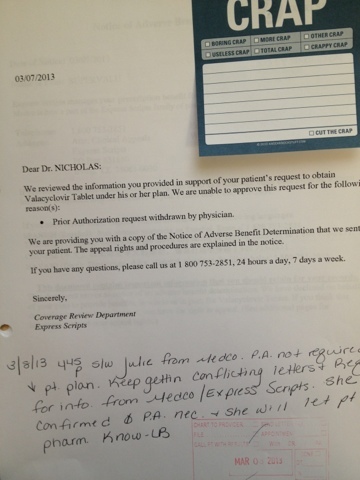 This saga started on January 8, when I received a PA form for valacyclovir, an anti-viral medication that is generic. 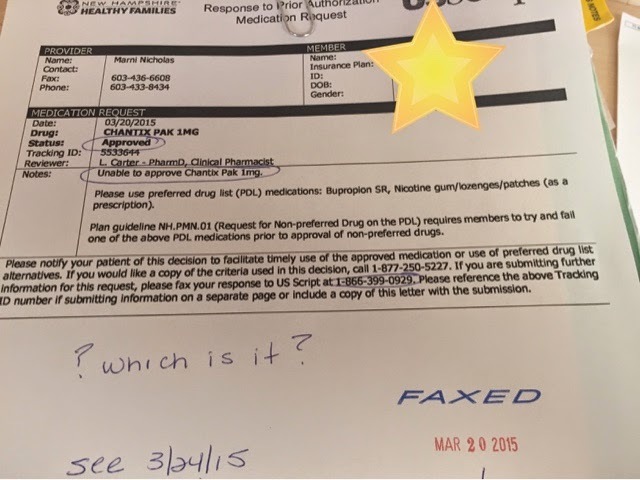 On January 10, I received a letter from Medco, stating that the PA was not even needed. 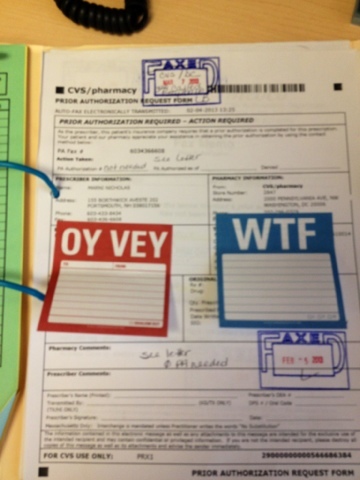 Please note, THE PATIENT HAD ALREADY PICKED UP THE MEDICATION ON JANUARY 8, THE SAME DAY I WAS MADE TO FILL OUT THE DAMN FORM IN THE FIRST PLACE. Then the patient’s pharmacy (CVS) called me asking, “Where the hell is the PA for this patient’s medication?” despite the fact that they HAD ALREADY DISPENSED THE MEDICATION TO HER! I faxed them the form form back saying that no PA was needed and faxed a copy of the letter to them. They apparently didn’t really care, because they sent me another request for a PA on February 5. I faxed them a copy of the letter again. 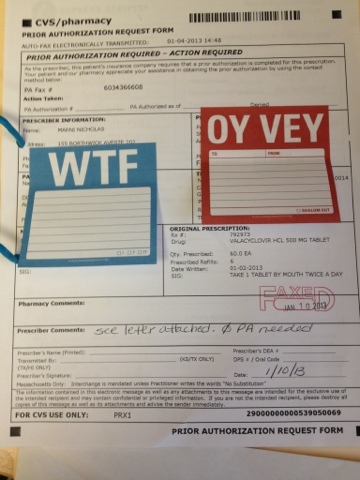 Then, today, I received another PA from Express Scripts for the medication! Two months into this saga. Like a good little soldier, I filled it out again. After I filled it out today (since I received it today), I got this fax, sent today but dated yesterday. Apparently, they are unable to approve the medication that they have already approved. Why not? Because apparently my evil twin withdrew the PA request. 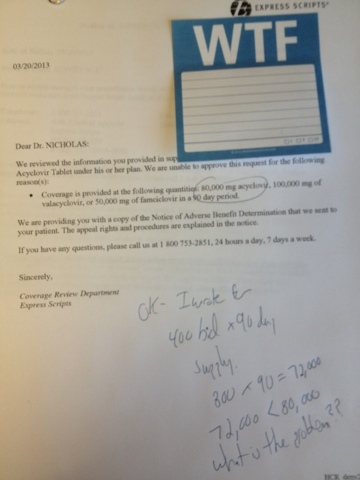 So, Medco tells me it’s not needed, Express scripts tells me it is, and hours of time are wasted. “Our merger is exactly what the country needs now,” said George Paz, chairman and chief executive officer, Express Scripts. “It represents the next chapter of our mission to lower costs, drive out waste in healthcare and improve patient health. We remain focused on formulary management, channel management and closing gaps in care, which will allow us to further improve the health of people with chronic and complex medical conditions. Yup. Tell me another one. 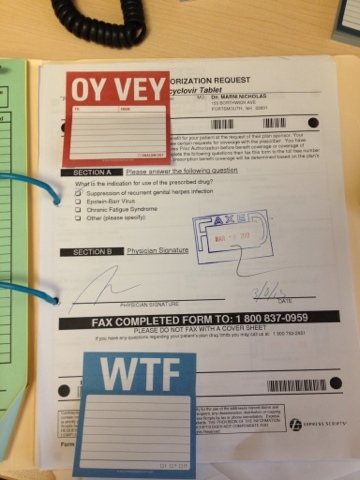 I can’t wait to see what’s waiting on the fax for me on Monday.